We live in a world where pretty much at any place, any time, you can be reached. You can be found, you can be tracked, you can be talked to. Almost everyone’s eyes are following their phones more than they are following the paths in front of them. It is actually kind of scary. Every so often in SC-200, we text SIOW to the number written on the board to participate in surveys and polls. One of the most recent times that this occurred, Dr. Andrew Read mentioned that cell phone use in class often times leads to lower grades. Glancing around the room from row to row I almost always see someone staring down and scrolling in their lap. I personally feel that the allowed cell phone usage that occurs in our class (voting in polls) is useful and encourages us to be engaged and participate. However, most of the time, when people pick up their phones to vote, I wonder: do they scan their notifications and read their texts or check Instagram and Snapchat and Twitter and Facebook and their e-mails and all of the other possible things they could check? 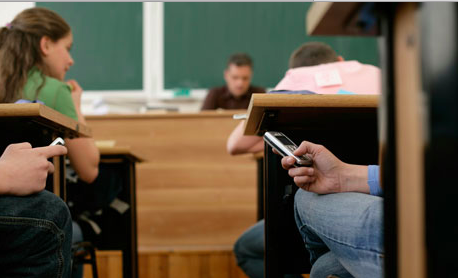 How distracting are cell phones really, and how much damage do they do to our grades? My hypothesis is that cell phone use during class lowers grades; that there is a causal relationship between the two. An article I found on Longwood University, written by Dr. Chris Bjornsen, discusses a study that explores this question. The study examined the in-class cell phone use of 218 students who filled out surveys after each class, indicating if and how they used their phones. Most people used them to check social media, while the least amount of people used them to play games (which is actually what I expected–I would never even think to play a game on my phone during class). Higher GPA correlated with less frequency of phone usage: 3.0 or higher GPA was averaged at 2.9 time-use per class while students with GPAs lower than 2.0 used their phones 3.8 times per class. This study found on Sage Journals accounted for multiple potential confounding variables that might affect GPA such as gender, academic year (freshman, sophomore, junior or senior), and smoker or non smoker were all accounted for. On top of that, after examining all of those results, they incorporated cell phone usage into the statistics. Before looking at phone usage, females generally had higher GPAs than males, freshman and juniors had higher GPAs than sophomores and seniors, and smokers had lower GPAs than non smokers, according to the study. However, people who used their cell phones more frequently in all of the categories ended up with lower GPAs than people who used them less frequently. The students who fit in all of the same categories (smoker, gender, grade) were compared with each other, and it was found that cell phone usage brought GPA down, all else equal. This article by Brian Heaton discusses a survey conducted by Kent State University, where increased cell phone usage lowered GPA. The difference in GPA between more frequent versus less frequent cell phone users was 0.31 points. That is a pretty significant difference, if you ask me. I can honestly say that I do not tend to check my phone in class at all. I figure, since it’s only 50 minutes to an hour and twenty minutes, I might as well pay attention. Sure, sometimes I daydream or doodle or have to pinch myself to stay awake, but I really try to resist the urge (that I admit I often have) to check my phone. Mostly because I think it is rude and disrespectful to have my eyes glued to my lap while someone is attempting to teach me something. But also, it’s because my parents pay good money for me to be sitting in each of my lectures. I don’t want to waste their money by scrolling through Instagram. If that’s what I came to college for, I might as well have not come at all. This entry was posted in Uncategorized on September 29, 2016 by Molly Mccarthy Tompson. I think that increased phone use during class could definitely be a valid causation for a lowered GPA. Although, I think that having my phone conveniently next to me while studying comes in handy for looking up terms on the spot that I do not understand. We spoke about this topic a little bit in class and from what I can remember we also discussed multitasking. In interviews, employers always want to hear that potential employees can multitask and juggle several obligations at a time while remaining efficient, but this does not always seem realistic. I would suggest a link between phones in class impacting GPA’s and human’s inability to multitask. Here is an article http://news.stanford.edu/2009/08/24/multitask-research-study-082409/ about a Stanford study which splits participants into groups of multitaskers and groups of singletaskers. The multitaskers underperformed overall compared to the group focusing on one task. I think this relates to your post, because looking at a phone while trying to pay attention in class would be multitasking. In addition to that, the article specifically mentions multitasking of electronic sources being an issue. So even when we are on our phone during class, we could be switching from the mail app, to texting our friend, and getting a Facebook notification. I definitely think excessive or over-use of cell phones in lecture classes has a negative effect on grades, especially when it comes to SC200. Personally, I keep my phone locked and in my backpack during our class, especially because I really have to listen in order to process Andrew’s information and take helpful notes on my handouts. Once or twice I have checked my phone during class, and the second I lock it and put it away I return to the conversation lost and scrambling to catch up, even if I only missed a few seconds! This article cites methods of using technology in the classroom that teacher Ken Halla has adopted in order to keep students engaged while also adapting to their technological lifestyle. While I’m not really a fan of technology in the classroom since I’m easily distracted, I think it was an interesting read! I thought this was definitely an interesting topic! Not only is it relevant but it’s such a new age problem that people are still trying to solve it. No one has an answer yet but there is a clear problem, phones inhibit learning. I personally think that in college, it should be up to the individual to be responsible enough to put away his/her phone during class but in middle and high school, I think phones shouldn’t be allowed in classrooms. Most young teens don’t have the will power or maturity to out it away and I think it’s in the student’s best interest to have a ban.